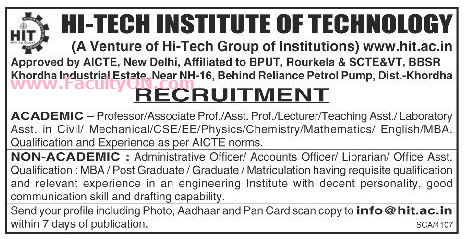 Hi-Tech Institute of Technology, Khordha has advertised in the SAMAJA newspaper for recruitment of Professor / Associate Professor / Assistant Professor / Lecturers Plus Non-Faculty jobs vacancies. Interested and eligible job aspirants are requested to apply within 07 days from 10th August 2018. Check out further more details below. About College: An Educational Institution is meant to explore and acquire newer ideas and methodologies, which help you being at the forefront. Hi-Tech Institute of Technology (HIT), yet another feather added to the illustrious cap of Hi-Tech group of Institutions for supporting the same adage. Having set milestones in Medical and Engineering education, Hi-Tech group has set its goal on churning out technocrats of excellence through HIT. One of the greatest and most rewarding professions in the world is engineering. And through the contribution of HIT to the field, is certain to bring a remarkable change. How to Apply: Interested and eligible candidates are requested to send application along with attested copies of certificates / testimonials, copy of PAN card, copy of Aadhaar card and recent PP size photos to the email address provided here.